Analysis: Davis will close out his 13th season with back-to-back absences due to a concussion. In 14 prior appearances, he mustered a 25-367-2 line on 36 targets working behind Jordan Reed (foot/ankle) for most of the campaign. With both tight ends sidelined, the Redskins will turn to Jeremy Sprinkle as the primary receiving TE, though Matt Flanagan will earn some snaps as well. Analysis: With fellow tight end Jordan Reed (foot) already on injured reserve, Jeremy Sprinkle could be looking at an every-down role Week 17. Davis will turn 35 in January and has one season remaining on a three-year, $15 million contract, with Washington able to save $5 million by releasing him during the offseason, per overthecap.com. Davis (concussion) was a limited participant in practice Wednesday, Les Carpenter of The Washington Post reports. Analysis: A late addition to the injury report last week with a concussion, Davis ultimately didn't suit up for a Week 16 loss at Tennessee. In the Redskins' first session since that contest, he's progressed enough to handle some on-field reps, but an independent neurologist still must clear him for game action. 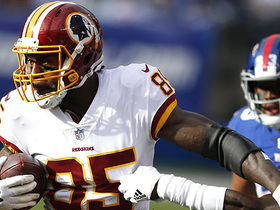 If he's able to return Sunday versus the Eagles, Davis could be Josh Johnson's primary tight-end option with Jordan Reed still tending to foot and ankle injuries. The Redskins downgraded Davis (concussion) from questionable to out for Saturday's game against the Titans. 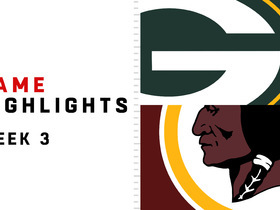 Analysis: Washington ruled No. 1 tight end Jordan Reed (foot/ankle) out for the game a day earlier, so Davis' absence now leaves Jeremy Sprinkle as the next man up at the position. Reed's injury appears significant enough to sideline him for the season finale Dec. 30 against the Eagles, so Davis could reclaim a starting role in Week 17 if he's able to clear the five-step concussion protocol beforehand. Davis is listed as questionable for Saturday's game in Tennessee due to a concussion. Analysis: With Jordan Reed (foot/ankle) ruled out for a second straight week, Davis and Jeremy Sprinkle were in line to handle significant workloads yet again. However, Davis has been diagnosed with a concussion just two days before a game, leaving his own availability up in the air. In the event Davis isn't able to play as well, the Redskins would trust Sprinkle and Matt Flanagan at tight end. Davis caught two of three targets for 16 yards in Sunday's 16-13 win over Jacksonville. Analysis: Davis left the game to be checked for a concussion at one point but was cleared to return. His impact while he was out there was limited, and Washington's only touchdown was scored by fellow tight end Jeremy Sprinkle. If Davis doesn't suffer any setbacks, he should be more involved against the Titans in Week 16. 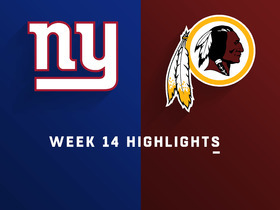 Davis caught each of his four targets for 31 yards in Sunday's 40-16 loss to the Giants. Analysis: Davis finished the afternoon with a season-high 49 snaps (79 percent), stepping up as the top tight end after Jordan Reed suffered foot and ankle injuries. The 34-year-old could be headed for an every-down role Week 15 in Jacksonville, but it will be difficult to take advantage of the opportunity with Josh Johnson starting at quarterback. Davis caught both of his targets for 15 total yards during Monday's 28-13 loss to the Eagles. Davis caught two of four targets for 73 yards and a touchdown during Thursday's 31-23 loss to the Cowboys. Analysis: Davis finished fifth on the team in targets, but he made the most of the looks he got. He got his team on the board with a 53-yard touchdown grab in the second quarter and later added a 20-yard catch as he set a new season high in yardage. Despite this nice effort, Davis' fantasy production tends to vary wildly from week to week, making him a risky fantasy play in Week 13's Monday night tilt versus the Eagles. Davis finished without a catch on two targets in Sunday's 23-21 loss to the Texans. Analysis: Davis has been held off the stat sheet the past two weeks after catching five of seven targets for 62 yards in a Week 9 blowout loss to the Falcons. With Alex Smith (leg) out for the season and Colt McCoy taking over at quarterback, Davis faces a challenge to rebound on Thanksgiving Day against the Cowboys. Davis was held without a catch on one target in Sunday's 16-3 win over Tampa Bay. Analysis: Davis took advantage of game script the previous week with five catches for 62 yards in a blowout loss to the Falcons. He fell all the way back to earth Sunday as the Redskins rediscovered their running-and-defense game plan. Davis should be a bit more involved Week 11 against the Texans, facing a defense that's struggled against tight ends (9.1 yards per target) while shutting down wide receivers (7.3 YPT) and running backs (3.5 YPC, 5.5 YPT). Davis caught five of seven targets for 62 yards in a 38-14 loss to Atlanta on Sunday. Analysis: Davis did his damage on just 32 snaps, benefiting from extra target volume in a game where Alex Smith tied a season-high mark with 46 pass attempts. Fellow tight end Jordan Reed (back/neck) got banged up along the way, but he was still catching passes deep into garbage time, suggesting he should be fine for Week 10 at Tampa Bay. If not, Davis will hold obvious appeal as a short-time addition to fantasy lineups in need of a tight end. Davis caught one of three targets for 21 yards in Sunday's 20-13 win over the Giants. 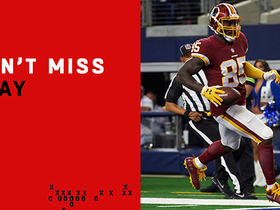 Analysis: Fellow tight end Jordan Reed led the team with 12 targets, but his struggles continued as he managed just 38 yards on seven receptions. Meanwhile, Davis is stuck in an unexciting role as the No. 2 tight end in a run-first offense, averaging 1.9 targets per game ahead of a friendly Week 9 matchup with the Falcons. 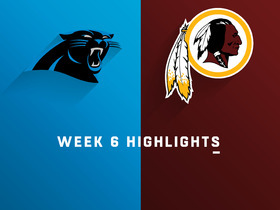 Davis brought in all three of his targets for 48 yards and a touchdown in the Redskins' 23-17 win over the Panthers on Sunday. Davis (hamstring) doesn't have a designation on the final injury report for Sunday's game against Carolina, Kareem Copeland of The Washington Post reports. Analysis: Davis is still stuck behind Jordan Reed, but this could be one of the few weeks when both players have featured roles in the offense, as Washington is dealing with a slew of injuries at the skill positions. Chris Thompson (ribs/knee), Adrian Peterson (ankle), Jamison Crowder (ankle), Josh Doctson (heel) and Paul Richardson (knee/shoulder) are all listed as questionable. The team would be wise to adjust by using more two-TE looks and fewer three-wide formations. Davis (hamstring) is listed as a limited participant on Wednesday's injury report. Analysis: Davis was deemed doubtful to return after injuring his hamstring in Monday's blowout loss to the Saints, but it seems he's doing a bit better a couple days later. That said, his practice status is just an estimate, as the Redskins merely held a walk-through Wednesday. With top tight end Jordan Reed staying healthy so far this season, Davis has been limited to seven targets in four games. Davis is doubtful to return to Monday's contest against the Saints after suffering a hamstring injury. Analysis: Before exiting the contest, Davis recorded two receptions for 15 yards on three targets. Look for more updates on the veterans' status to come later this week once the Redskins resume practice. Davis caught both of his targets for 70 yards in Sunday's 31-17 win over the Packers. Davis hauled in his sole target for seven yards in Sunday's loss to the Colts. Analysis: After leading tight ends in offensive reps Week 1, Davis took a back seat to Jordan Reed against the Colts, logging only 26 reps -- 35 percent of all offensive snaps. Reed has been hot to start the season, and he will likely continue to see the majority of tight end targets as long as he remains healthy. Still, Davis should remain a part of the offense, if only just for blocking purposes. Davis caught his only target for a nine-yard gain in Sunday's 24-6 win over the Cardinals. Analysis: Davis actually led Washington tight ends with 47 snaps on offense (59 percent), but Jordan Reed parlayed 41 snaps into a 4-48-1 receiving line on five targets. Davis likely will focus on run blocking once again in a Week 2 matchup with Indianapolis. Davis caught one of four targets for two yards in Friday's preseason game against Denver. Analysis: Davis accounted for half of Alex Smith's pass attempts, but it was far from a productive night. The 34-year-old tight end dropped a third-down pass on his first target and later came up one yard shy of the marker on a 4th-and-3. Davis is one of the better No. 2 tight ends in the league, but he's simply no match for Jordan Reed (toe) in terms of pass-catching skill. Reed was held out of Friday's game despite practicing for the past few weeks. Davis said Alex Smith has improved since the two played together in San Francisco from 2006 to 2012, ESPN.com's John Keim reports. Davis, who hauled in two of his three targets for 20 yards in Week 17's loss to the Giants, ended the season with 43 receptions for 648 yards and three touchdowns in 16 games. Davis caught two of three targets for 42 yards and a touchdown in Sunday's 27-11 win over the Broncos. Davis recorded two receptions for 18 yards but fumbled once in Sunday's 20-15 win over the Cardinals. Analysis: Even without Jordan Reed (hamstring) on the field, Davis has struggled to make ends meet the last few weeks, recording six receptions for 59 yards over the past four games. To put that into perspective, Davis managed over 59 receiving yards in all but one contest from Week 4 through Week 11. Given the current slump, the veteran doesn't seem like an ideal fantasy option next Sunday against the Broncos, one of the league's best passing defenses. Davis brought in two of seven targets for 26 yards and a touchdown in Sunday's 30-13 loss to the Chargers. Davis hauled in both of his targets for 15 yards in Thursday's loss to the Cowboys. Analysis: Davis hasn't found the end zone since Week 3 and hasn't had over three receptions in a contest in three weeks. Should Jordan Reed (hamstring) return this week, Davis would likely see a drop in offensive reps, making him a less than ideal fantasy option for Week 14. Davis was targeted just once and failed to record a reception in Thursday's 20-10 Thanksgiving win over the Giants. Analysis: Davis failed to take advantage of fellow tight end Jordan Reed's (hamstring) absence. While both offenses were held in check for much of the night, the veteran tight end's lack of production was still disappointing. It was the first time since Week 1 that he was unable to haul in a catch. He will look to bounce back next week versus the Cowboys. Davis is in line to start Thursday's game against the Giants with fellow tight end Jordan Reed (hamstring) unavailable. Analysis: Davis has averaged 5.3 catches for 68.3 yards on 7.8 targets in the four games Reed has missed this season. The 33-year-old now gets to face a Giants defense that has given up a league-high 10 touchdowns to tight ends, along with 59 receptions (tied for third-most) and 752 receiving yards (also third-most). Davis caught three of six targets for 67 yards in Sunday's 34-31 overtime loss to New Orleans. Analysis: Davis once again contributed a solid performance while seeing an expanded role with Jordan Reed (hamstring) sidelined. The veteran tight end still hasn't found paydirt since Week 3, though. 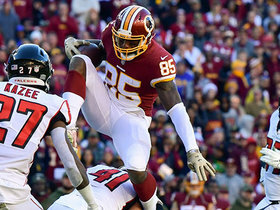 Davis will be in line for a third straight start Sunday against the Saints with top tight end Jordan Reed (hamstring) ruled out for the contest, Master Tesfatsion of The Washington Post reports. Davis hauled in seven of 11 targets for 76 yards in Sunday's loss to the Vikings. Analysis: It was the second game in a row Davis had over 70 yards receiving filling in for an injured Jordan Reed (hamstring). So far this season the veteran tight end has managed 30 receptions for 460 yards and a touchdown, as he continues to prove age is just a number. His fantasy value against the Saints will be entirely dependent on Reed's status, who is nearing a return. If Davis is the top tight end option, look for him to see a fair number of targets from Kirk Cousins. Davis will start for Jordan Reed (hamstring) on Sunday versus the Vikings, John Keim of ESPN.com reports. Analysis: Davis emerged from last Sunday's victory at Seattle with injuries to both hands. In particular, the right one was swollen, but he managed to log full practices both Thursday and Friday, clearing up any doubt about his ability to play. He'll be needed with Reed and reserve tight end Niles Paul (concussion) out of commission. On the season, Davis is averaging a spectacular 12.4 YPT, but his touchdown count (three in 24 games) as a Redskin leaves much to be desired. Davis (hand) doesn't have an injury designation for Sunday's game against the Vikings, Master Tesfatsion of The Washington Post reports. Analysis: Meanwhile, Jordan Reed (hamstring) missed Friday's practice and is listed as questionable on the final Week 10 injury report. With his hand injuries confirmed to be minor, Davis seems to be on track for another week serving as Washington's top pass catcher at tight end, though it may not be confirmed until inactive lists are released approximately 90 minutes before Sunday's 1:00 p.m. ET kickoff. Reed likely will have a limited role if he ends up playing. Davis (hand) turned in a full practice Thursday. 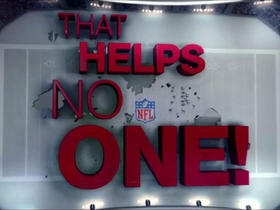 Davis was limited at Wednesday's practice due to injuries to both hands, Rich Tandler of NBC Sports Washington reports. Analysis: While neither issue is considered serious, Davis' condition is still worth tracking throughout the week. Meanwhile, Jordan Reed (hamstring) managed a limited practice Wednesday, which suggests the team's top tight end is shooting to return for Sunday's game against the Vikings. The Redskins have managed to keep both tight ends involved in the offense at times, but Reed's return would obviously be a huge hindrance to Davis' Week 10 outlook. Redskins head coach Jay Gruden said Davis "should be OK" after bruising his hand in Sunday's win over the Seahawks, John Keim of ESPN.com reports. Davis hurt his hand during Sunday's 17-14 win at Seattle. Analysis: Davis acted as the No. 1 receiver in an offense devoid of Jordan Reed (hamstring) and Jamison Crowder (hamstring), turning a team-high nine targets into six receptions for 72 yards. Because the injury occurred so late in the game, the Redskins may have been exercising caution with their most-experienced pass catcher. Once the severity of the injury is known, a prognosis may become clear. Davis is poised to start at tight end Sunday against the Seahawks with Jordan Reed (hamstring) ruled out for the contest, Stephen Czarda of the Redskins' official site reports. 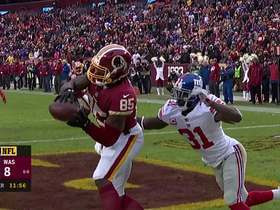 Washington Redskins quarterback Josh Johnson tosses a perfect pass to tight end Vernon Davis for a two point conversion. 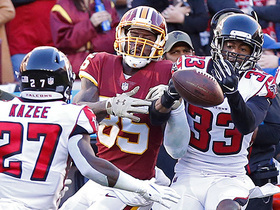 Atlanta Falcons safety Damontae Kazee snags a tipped pass for his fourth interception of the season. Washington Redskins tight end Vernon Davis leapfrogs defender on a slick hurdle. 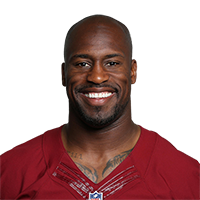 Washington Redskins tight end Vernon Davis catches the short pass for a 21-yard gain. 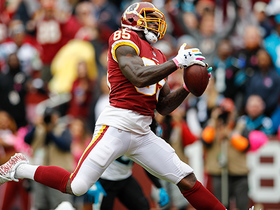 Watch as Washington Redskins tight end Vernon Davis beats out Carolina Panthers defense for his first touchdown of 2018.